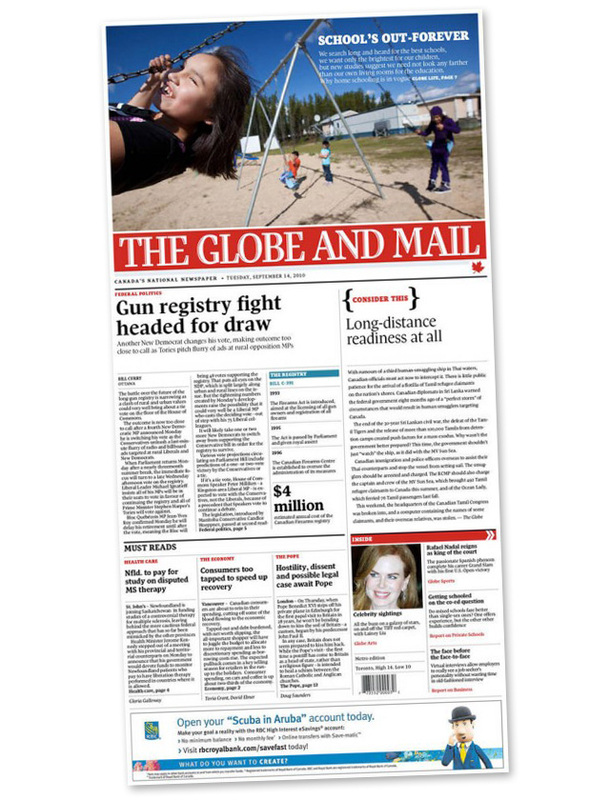 That there is a prototype of the Globe and Mail‘s new front page, part of a massive redesign, profiled in this month’s Toronto Life, that’ll be rolled out on October 1. Let’s all argue about it. If you liked the Toronto Star‘s Sunday story on a piece of guerrilla art in Trinity Bellwoods that might, in spite of its loveliness, be damaging the tree it was put on, you’ll love our story about it from four days earlier. Someone messed with the Hug Me Tree, which is back on Queen West after a stint in the ROM. “People who don’t drive much—including most true bike zealots—significantly subsidize those who drive a lot.” So it goes in Vancouver, and, you’d think, here too. Krispy Kreme is opening at Bathurst and Harbord, if the sign outside the building near the southeast corner of the intersection is to be trusted. From BlogTO, “The top 10 Toronto landmarks,” and “The top 10 Toronto landmarks: take two,” which are definitely two of the top ten most provocative top ten lists on BlogTO right now.